HAPPY DONABE LIFE - Mrs. Donabe's Rustic Japanese Kitchen: New Donabe & Japanese Cooking Class announcement..."Power of Koji"
New Donabe & Japanese Cooking Class announcement..."Power of Koji"
February will be an eventful month! I will be hosting donabe cooking classes and also be participating in cool events, presented by Common Grains. Following our popular Miso-making class, this is our new “koji” theme class. Koji is a type of mold and it’s also a starter for Japan’s essential foods and drinks such as miso, soy sauce, sake, etc. Koji is known not only for its ability to bring out good “umami” flavors, but also for its health benefits because of its live enzymes. Today, the popularity of traditional koji products such as shio-koji and amazake is surging in Japan, and people are rediscovering how wonderful they are for their healthier and more wholesome lives. “Shio-koji” (salt-marinated koji) is an all-purpose seasoning and you can use it as marinade, sauce, or simply as a replacement for salt. “Amazake” (literally translates into “sweet sake”) is a non-alcoholic naturally fermented drink from koji and steamed rice, and it’s considered to be a super food (it’s often called “drinking I.V. drip”!) for its remarkable nutritious value. In this workshop, you will make your own “shio-koji” to take home with you! Naoko will also show you how to make amazake in donabe as well as dishes by using shio-koji, amazake, and other koji-related ingredients. Please check out our website for sign-up info and more details. Sorry...this class is already sold out, too. Please check with Tortoise General Store for future donabe classes. We are pleased to be part of Common Grains projects in LA and participate in the following events in February. 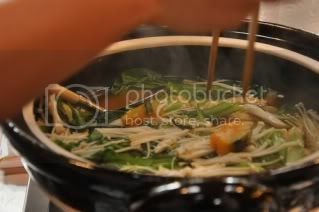 Come see the donabe rice cooking in action (1-3pm). Click for more details. 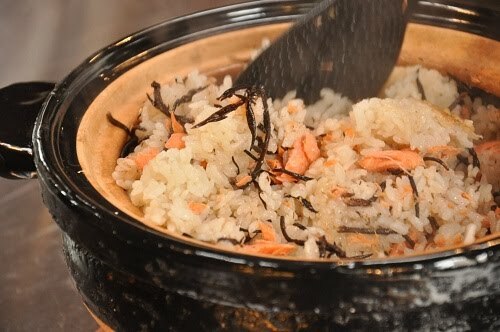 We will make donabe rice dish with Anson Mills' special grains (11am-1.30pm). Click for more details. We will give an onigiri-making workshop for parents and children (11am-12.30pm). Click for more details. Hope to see many people at these events...Happy Donabe life.